Garden Route Game Lodge, offering Big 5 South African Safari experience, is situated in the heartland of the world famous Fynbos Botanical Route, offers you the Big 5 in a malaria free environment. Conveniently located off the N2 between Albertinia and Mossel Bay. Only 3½ scenic hours drive from Cape Town, one hour from Swellendam and 30 minutes from Mossel Bay on the Garden Route. Set against the backdrop of the majestic Langeberg mountain Range, the Garden Route Game Lodge guards the entrance to South Africa's world famous Garden Route Coast. Garden Route Game Lodgeis a malaria free private game reserve is home to an abundance of animal & birdlife including the BIG 5 - lion, elephant, white rhino, buffalo and cheetah at Garden Route Game Lodge . Visitors to the Garden Route Game Lodge can enjoy game viewing in open Landrovers, luxury accommodation and a memorable dining experience in our Boma restaurant. Our friendly staff and management are there to take care of your every need to complete your unforgettable stay. Morning and evening game drives at Garden Route Game Lodge are led by experienced and knowledgeable game rangers who share their knowledge of big game as well as the many other antelope species, birdlife and local African folklore. Garden Route Game Lodge is currently home to giraffe, white rhino, lion, elephant, buffalo, kudu, zebra, wildebeest and 24 more species that make up a total of more than 400 animals. Return transfers in luxury air-conditioned coaches can be arranged from your hotel or guest lodge in Cape Town. For more information on hotel transfers contact us. The GardenRoute Game Lodge was started in 1999 as an ambitious project to restore an area of once degraded farmland to its former glory and stock it with game that previously occurred there. With the assistance of Dr Ken Coetzee of Conservation Management Services, a scientific study was conducted with the emphasis on sustainable utilization, long term conservation of the remaining natural habitats and the rehabilitation of already degraded lands. Once completed, scientific calculations were used to determine the carrying capacity of the reserve and the restocking program could begin. Today a large variety of wildlife including the BIG 5 are once more at home in this private game reserve. Morning and evening game drives are led by experienced game rangers who share their knowledge of big game as well as the many other antelope species, birdlife and local African folklore. Garden Route Game Lodge is currently home to cheetah, lion, giraffe, white rhino, elephant, kudu, zebra, wildebeest, buffalo and many other species of game. A visit to the recently established Cheetah Breeding Center will provide visitors with an insight into the plight of this endangered species. No stay at the Garden Route Game Lodge is complete without a tour of the Reptile center where our resident Herpetologist (snake man) will share his knowledge of snakes, crocodiles and other cold-blooded creatures. An absolute must for families. We offer relaxing guided trail rides in the main reserve for the experienced rider. Ride in harmony with nature and enjoy close up wildlife encounters in this exquisite setting. For the less experienced rider, we offer rides around the Lodge camp. There are horses to suit every level of experience and also offer “lead” rides for children. Mountain bike trails on the various farm roads in the area offer a challenge to the energetic. Enjoy a guided adventure trail on a 4x4 quad bike in the Gouritz River Valley which winds through scenic mountain passes and valleys, over streams and finishes up in the Gouritz River bed. Please note: All bookings must be paid in full on confirmation or by providing a valid credit card to guarantee your booking..
morning game drive. Julius and the guests on his game viewer had sighted the female in the thicket when the calf emerged from underneath her. The entire party was overcome with excitement at being the first to witness this small miracle of nature. A rhino calf can weigh 65kg at birth reaching a weight of up to 2,7 tons at maturity. White rhino calves are able to walk with their mothers 3 days after being born and are weaned after one year. A white rhino cow can breed between the ages of 6 and 40 years and can produce 14 calves during her lifetime. 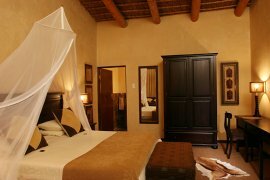 Our recently refurbished spacious Lodge rooms combine luxury and comfort with an African theme. Complete with en suite bathrooms, the Lodge rooms lead onto a West facing balcony which offers breathtaking African sunsets all within steps of the pool. These rooms are ideal for families and are located closer to the Lodge amenities. 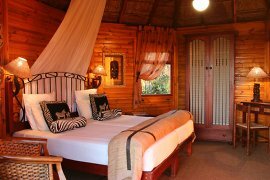 Exclusive Garden Route accommodation in luxury thatched chalets with en suite bathrooms designed to offer guests complete comfort and relaxation in a beautiful setting. The use of natural materials such as thatch, stone and timber, blend in with the African style decor to create an unforgettable impression. Linked to the Main Lodge via a wooden walkway overgrown with Aloes and fynbos, the chalets offer seclusion and privacy ideal for honeymoon couples. Dining at the Garden Route Game Lodge is a relaxed affair where guestsget a chance to discuss the days game viewing and make new friends. Dinner in our African Boma provides guests with a unique dining experience where a hearty menu of tasty traditional cuisine and chefs specialities are presented on open coals in African pots. Our friendly and attentive waiters are on hand to explain the menu or advise you on our selection of fine South African wines at Garden Route Game Lodge. Game Reserve in Limpopo where the reserves elephant population had increased beyond sustaninability and a decision was made to reduce the numbers. Usually this would be achived through a culling operation or by tendering to outfitters. It was at this point that well known elephant operator Rory Hensman contacted the reserves management and offerd to relocate 20 elephants to his operation in Tzaneen. and Greg Vogt of the Elephant Tourism Association the two ellies were identified for suitable reintroduction at Garden Route Game Lodge. Well known wildlife vet Douw Grobelaar and his game capture team were contacted and arrived with the cow and bull on 2nd December at around midday. All the neighbours from the nearby farms came to watch the spectacle and after a few minor hiccups the two ellies were safely offloaded from the truck. Garden Route Game Lodge is delighted to announce the release of two male cheetahs into the game reserve. The two brothers were released on Friday morning the 7th September 2007 making history as the first free roaming cheetah in the Garden Route and Southern Cape. The release was attended by Cape Nature as well as the Dept of Environmental affairs and Tourism and various media liasons. Another first for the Garden Route Game Lodge!